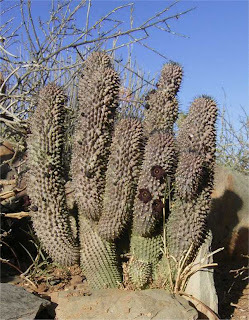 Many websites will state that in the Bushmen's language, Hoodia gordonii is known as "Ghaap". Strictly speaking this is not entirely true. The Bushmen do eat Hoodia gordonii,but refer to it rather as "Jakkals Ghaap". Translated as "Jackal Ghaap" meaning that the plants are fit to be eaten by jackal rather then humans. The likely reason being the bitter pungent taste of Hoodia gordonii. A jackal (a somewhat similar animal to the American coyote), will of course not touch a Hoodia, but it sort of illustrates the Bushmen's contempt for both. An adult plant of Hoodia gordonii in the wild. This is quite an old plant and not expected to live much longer. Hoodia gordonii can grow to a height of approximately one meter. The plants have a limited life span however. and most plants will actually die before reaching this size. The picture was taken in the Tanqua karoo. Occasionally there exist relatively dense populations of about 100 plants per hectare. There are some more plants in the background of this picture. Mostly the plants are scattered far and wide. Unlike Hoodia gordonii, many Trichocaulons have a rather sweet taste. An adult plant of Hoodia pilifera variety pilifera.This plant was previously known as Trichocaulon piliferum. It is native to the dry areas of the Southern Cape. Adult plants reach a height of approximately 30 cm or more. The adult plants are much smaller then Hoodia gordonii. Cultivation from seed is difficult, and the seedlings seem to be more prone to die then numerous other Hoodia we have grown. 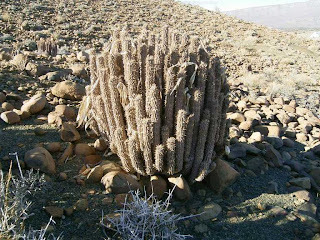 Hoodia pilifera is one of the first Hoodia discovered by white settlers in South Africa. It also has appetite suppressing properties. Why then do the Bushmen eat Hoodia gordonii ? The reason is that Hoodia gordonii is far more common then any of its similar relatives. The Bushmen will rather eat Trichocaulons,... if they can find them.